MK Nava Boker prepares bill to allow death sentence for terrorists in civil court rather than military court. Dealing with terrorism in Israel and around the world appears to be an increasingly complex task. 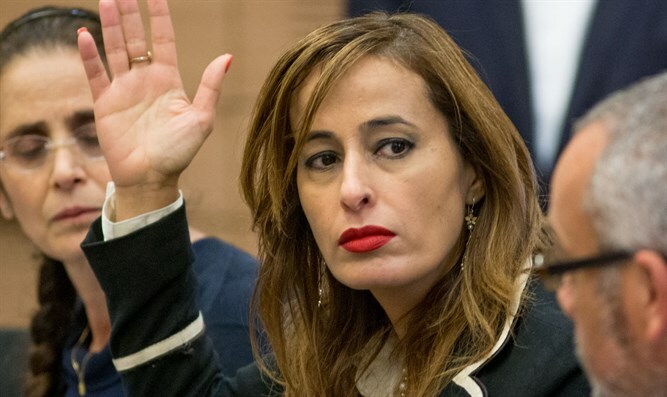 Knesset Member Nava Boker (Likud) is promoting legislation that, in her opinion, will be able to stop terrorism. The mainstay of this legislation is the death penalty for terrorists. In an interview with Arutz Sheva, MK Boker lists other clauses included in the bill she is formulating. Among them, the complete isolation and separation of terrorists from their comrades in prison, and downgrading conditions provided them within prison walls. MK Boker notes that today, the one who is separated from his terrorist friends is Marwan Barghouti, but this is in order to prevent his influence on other prisoners. "The terrorist will sit in a single cell, without communication devices, will receive food in the cell, and visits will be in accordance with the Geneva Convention's requirements and no more, namely forty minutes once every two weeks," she said. Regarding the death penalty that she intends to include in the bill to be submitted at the beginning of the next Knesset session, she notes that while the death penalty currently exists in military court, in practice it is not utilized, whereas in civil court the death penalty is intended only for the Nazis and their accomplices. Her bill includes allowing the Attorney General to transfer a terrorist case from the military court to the civil court, where the option of a death sentence will be extended to include terrorists from a certain level of criminality. In her remarks, MK Boker notes that the bill is being prepared in coordination and consultation with experts who support the move. However, asked whether she heard objections to such a move out of fear of stirring up the Arab street or out of the belief that in any case, a terrorist who sets out to carry out a terrorist act takes into account that he will not get out alive: "Every person has a survival instinct that brings them to flee the scene of the attack. Every murderer wants to live, and if we succeed in deterring half of the terrorists, that is enough." And what about the expected ferment on the Arab street? "This population understands only force, and if we act hard and demonstrate deterrence and determination, they will think twice," she said. According to her, the Arab street is in constant uproar and one should not fear it, since this is an existential danger facing the State of Israel and its citizens. A question was asked about the PM's position on the issue of the death penalty following the murder of the Salomon family in Neve Tzuf, while no one seems to be promoting the move. In her opinion, there is support on Netanyahu's part for the idea and for promoting legislation in this spirit, even if she herself did not hear it explicitly. MK Boker was asked to address the question asked more than once by the Left - whether the death penalty will apply to those who are defined as "Jewish terrorists". According to her, she herself raised this question before the experts with whom she consults and does not intend to amend the entire Penal Code to deal with all the various types of murder, but rather with those who are defined as enemies. "Even despicable murderers are not the enemy; the goal of those terrorists is to destroy us, I condemn every murder, but I relate to the enemy's actions. We are in existential danger. " On the possibility of bringing Knesset members of various factions to support her proposal, she mentions that "Yisrael Beiteinu tried to submit a bill when they were in the opposition and it did not pass. I assume that I will get support from them. I have not yet turned to Yair Lapid."